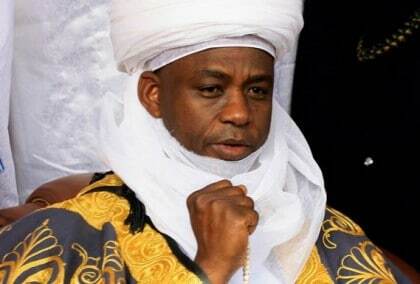 The Sultan of Sokoto, Alhaji Sa’ad Abubakar, has said that successful societal and economic transformation would succeed when they are supported and energised by value system. Abubakar stated this at the “Traditional Rulers Day”, as part of activities marking the 50th Anniversary of Rivers in Port Harcourt on Wednesday. The Sultan, who delivered a lecture entitled: “Traditional Institution In Nigeria And The Challenge Of Re-Engineering Viable Local Economies”, said that no society could develop without its value system. He said that the institution as custodians of societal values and norms were therefore critical component of any serious and sustainable transformation of the society. “This is particularly so with the economic transformation and the fight against corruption,” he said. Abubakar identified poverty and unemployment as a challenge with multi links and consequences that could be associated to issues of national security or insecurity. He said that while government at all levels have the responsibility within the constraints of its budget to address the issues, the traditional institution also have an important role to play. According to him, the traditional institution by proximity to the poor, have a deeper understanding and appreciation of the levels of poverty. “By their presence and grasp of the local environment, they are better positioned to drive any genuine transformation of the local economy. “Being the direct leaders of the poor, they are part of the major stakeholders in the alleviation of poverty, they daily bear the brunt of the consequence of poverty,” he said. Abubakar advocated the urbanising and building of industries in the local areas to achieve a sustainable economic policy. He said that economic industries where craftsmen and other professionals would be trained to meet the daily needs of the societal was indispensable. “Such society will have value of dignity of labour in order to inculcate hard work and discourage laziness and begging,” he said. The sultan urged Nigerian leaders to learn from the mistakes of the past to move the nation forward. “As a nation, we have gone through and surmounted the worst of all, a civil war. I think we have lessons to learn from that because very few nations could survive civil war. “We must check the lessons and guard against repeating such mistakes and move forward,” he said. Abubakar said that the traditional institution had quality and educated people with the best of professions. “The institution is fountain of knowledge for political leaders to tap from free of charge as we progress further in nation building,” he said.